Voice-messaging service Bubble Motion has raised $10 million in growth capital to speed up the roll-out of Bubbly, a voice blogging service that has seen tremendous traction among mobile users across Asia. This round of fund-raising was led by SingTel Innov8, the SingTel Group's corporate venture capital fund, while Infocomm Investments, Sequoia Capital, Palomar Ventures and NGC also participated. Innov8 is a corporate venture capital fund with a fund size of $200 million. In India, Bubble Motion partners with top operators including Bharti Airtel, Reliance Communications and Vodafone to offer voice-based services such as celebrity voice chats, voice messages and voice blogs. 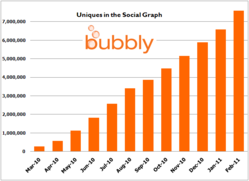 Bubbly registered 500,000 users in March, 2010, which skyrocketed to over two million users by June. The fast-growing user base had 1.2 million paid subscribers across multiple telecom operators in India, TechCrunch reported last year. The Singapore-based Bubble Motion now has seven million users across India, Indonesia, Japan and the Philippines. It claims to have delivered over 250 million bubble messages through its service bouquet. Launched in 2005, Bubble Motion was co-founded by entrepreneurs Sunil Coushik and Venu Sriperumal. The company received a seed fund of $5 million from unnamed angel investors and in 2007, Sequoia Capital and its Indian arm led a $10-million funding round. In 2008, the company raised $14 million from Sequoia Capital again, and Comcast Interactive Capital. Bubble Motion raised another $6 million in July 2009 in a round led by Palomar Ventures. With the current round, the company has raised a total of $45 million till date. The strategic round of financing will be used by Bubble Motion to expand into new countries and scale up its technology platform. Bubbly will also be ported onto more operators, mobile Internet and smartphone applications. Investor SingTel brings to the table a network of operator partners and contacts. "Given our focus in mobile social media in Asia, the two new investors on board perfectly fit our current strategy," said Thomas Clayton, CEO of Bubble Motion. "We are excited to have SingTel and Infocomm Investments joining our group of existing patrons as we continue to shape the mobile social media landscape in Asia and beyond," he added. "Bubble Motion has assembled a world-class team in Singapore. It is another leading tech start-up, leveraging Singapore's position as a base for technology innovation and addressing the fast-growing Asian market," said Dr Kuo-Yi Lim, CEO of Infocomm Investments. Bubble Motion also works with Telkomsel in Indonesia, and Globe in the Philippines. "We have been impressed with the strong growth of the Bubbly service across Asia and are excited to be joining up with the Bubble Motion team," said Yvonne Kwek, CEO of SingTel Innov8. "We are looking forward to working with the company to build and expand on their early success." A competitor to Bubble Motion is the New Jersey-based Kirusa Inc, which has raised funding from a slew of funds including Helion Venture Partners, Nexus India Capital, Qualcomm Ventures, and Erasmic Venture Fund (now Accel India). Kirusa's clients in India include Vodafone, MTNL, Loop Mobile, Tata Teleservices and Idea Cellular.